Bacterial wilt (also called "southern bacterial wilt") is a disease caused by a bacterium, Pseuclomonas solanacearum, which lives in the soil. 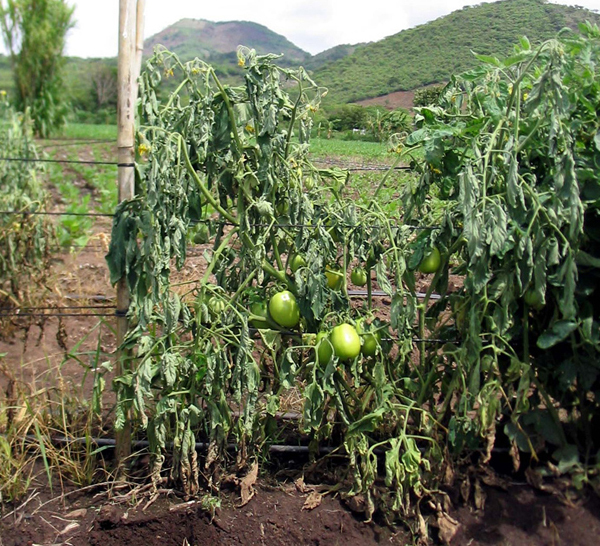 Its symptoms are different from other tomato wilt diseases. When bacterial wilt attacks, foliage doesn’t become yellow and spotted. Rather, the plant wilts and dies quickly with little warning. Bacteria work their way up through the plant’s roots or stem, most often where plants have been cut, injured or weakened by transplanting, cultivation, insects, or other diseases. They clog water-conducting tissue in the stem. Water and nutrients can’t reach branches and leaves, starving the plant. The plant dies. What does bacterial wilt look like? Interior of main stem (when split) is dark and water-soaked, the result of plugged water-conducting tissue. In late stages, the stem may become hollow. When does it affect plants? Bacteria are most active in temperatures above 75ºF, in wet conditions, and when soil has a high pH. How can you know that it’s bacterial wilt for certain? How do you control and treat bacterial wilt? Avoid physical damage to roots and stems, especially when planting and cultivating. Control root-knot nematodes, which are known to weaken tomato roots and allow bacteria access to plants. How do you prevent bacterial wilt? Rotate crops. Bacterial wilt can survive indefinitely in the soil. Plant tomatoes no more than once every four years in the same spot. Avoid planting other Solanaceous crops (potato, pepper, and eggplant) in the same area, too – they are susceptible to the bacterium. Instead, plant non-susceptible crops in those spots, like beans, corn, and cabbage. Choose resistant varieties. Neptune, Tropic Bay, and Kewalo are varieties that are considered to be partially resistant to bacterial wilt, although they are not commonly grown. 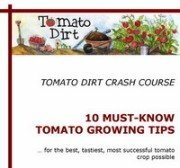 Plant tomatoes in well-drained soil with a balanced pH. Space plants generously. Extra room in between plants allows air to circulate. Remove and destroy affected plants at the end of the season. Till surrounding soil to reduce spread of the disease. Wash your hands after handling infected plants. Bacterial wilt also attacks eggplant, pepper, potato, cosmos, and sunflower. Bacterial wilt is common in Florida and other high temperature, high humidity regions.